The Rubbermaid Commercial BRUTE Trash Can Dolly provides a steady, mobile base for BRUTE trash cans from 20 to 55 gallons. 5 rugged, non-marking casters move fully loaded BRUTE trash cans smoothly even across rough and uneven surfaces. Constructed of sturdy structural foam, these garbage can dollies can transport up to 250 lbs. quickly and quietly through any facility while an innovative twist-lock design keeps receptacles securely mounted on the dolly. Mover's Dolly 1000lbs Furniture Appliance18" X 12-1/4"
We have a instruction manual in each package.If you don't find it,or don't know how to adjust or use the straps,please kindly contact us,and we can send it by email. 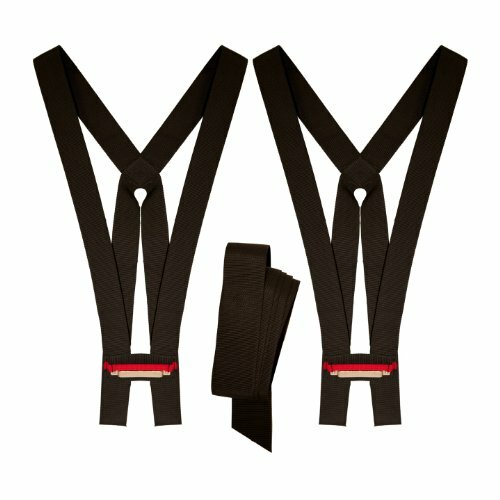 lifting,carrying and moving straps 1.Easy move furniture(dresser,desk,couch etc),appliances(washer,dryer,refrigerator etc),mattress and some other heavy objects,by using our best two man/women movers straps. 2.Easy opening doors,going upstairs, grasping railings, and balancing objects. 3.Help save much money,no need to hire movers. 4.800 Lbs load capacity,not 600 lbs or less like others.With 30 metallic thread inside,our straps can carrying,lifting and moving heavy objects much easy. 5.Unlike dollies and hand trucks,the straps won't scratches, dents, scuffs and scrapes floors. 6.Easier go upstairs than dollies and hand trucks. 7.Fully adjustable,one size fits all.Different from unadjustable straps,or straps which only can be adjusted to 14.5 ft,our length can be easy adjusted from 8.2 ft to 15.1 ft.Easy and secure carrying,lifting and moving short or long objects. 8.Easy arm lifting or cross carrying objects. 9.No back pain.You can still return to work next day. 10.No shoulder pain.Our weight carrying,lifting,and moving straps come with removeable support braces,strong protect your arm or shoulder,so there will be no shoulder pain in the future. 11.Different body height and weight people can use the straps. 12.No worry to stain walls, floors,doors, or furniture any more,by using our straps. 13.To lift an object, both people need to place the straps under the furniture or appliance etc, squat to adjust the webbing according to their heights and weight of the furniture or appliance etc, then stand up! 14.Each package includes lifting carrying moving straps,support braces and instruction manual. 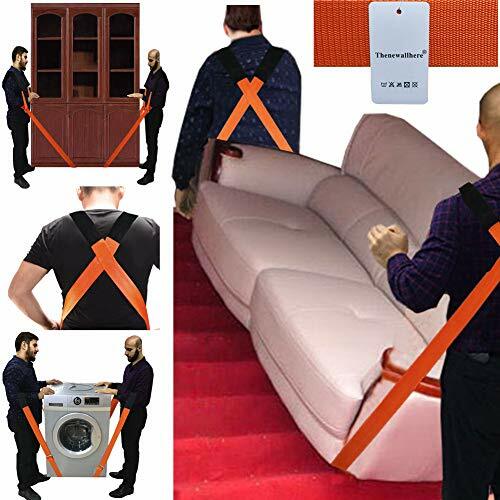 The straps are designed for moving,lifting and carrying some heavy objects,like furniture(dresser,desk,couch etc),appliance(washer,dryer,refrigerator etc) and mattress etc.Easy opening doors,grasping railings,and balancing objects.Save cost from hiring movers.Time and back save and no back pain in the future. 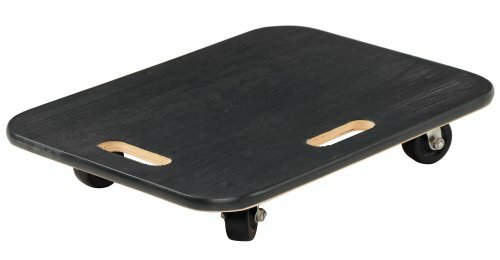 No floor scratch from dollies and hand trucks,and easier go upstairs than dollies and hand trucks if using the lifting,carrying,moving straps.Easy switch between shoulder or arms. 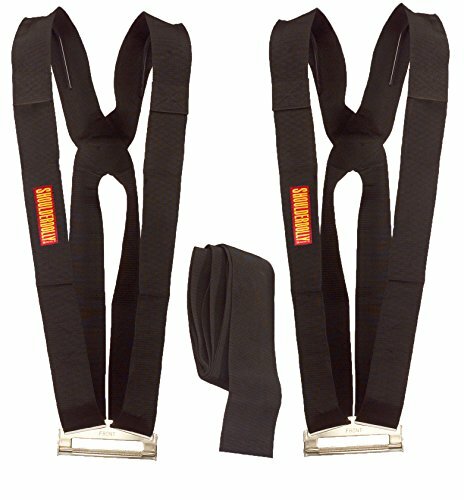 Fully adjustable,one size fits all.Unlike the other unadjustable straps,or straps which only can be adjusted to 14.5 ft,our length can be easy adjusted from 8.2 ft to 15.1 ft.Different weight and height movers can easy arm lifting or cross carrying or moving heavy objects with the straps. 800 Lbs load capacity,not 600 lbs or less like others.With 30 metallic thread inside,our straps can carrying,lifting and moving heavy objects much easy. No shoulder pain.Our straps come with removeable support braces,strong protect your arm or shoulder when weight carrying,lifting or moving,so there will be no shoulder pain.Contents:straps,support braces and instruction manual. 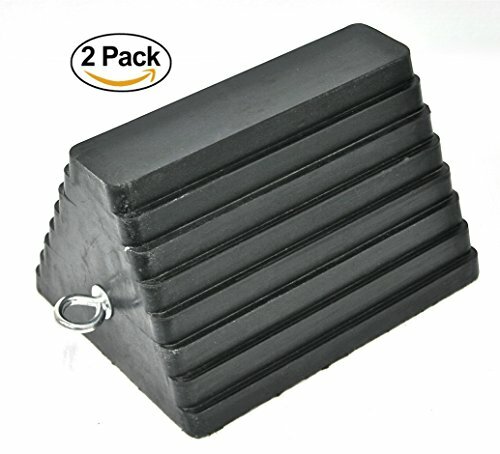 Our MaxxHaul Solid Rubber Wheel Chocks - 2 pack features all weather construction and a rubber traction pad that make them the perfect choice to keep your vehicle or trailer secure in any climate. The non-slip surface is oil resistant to provide superior traction. Maxxtow wheel chocks are lightweight yet durable enough to keep almost any vehicle or trailer in place. The Professional Bucket Dolly is a quick and easy way to take your wash bucket on the move. This heavy duty bucket dolly is constructed of durable plastic with professional quality rolling caster to handle any detailing challenge. Save your energy by rolling your bucket around rather than carrying it around as you wash and clean. 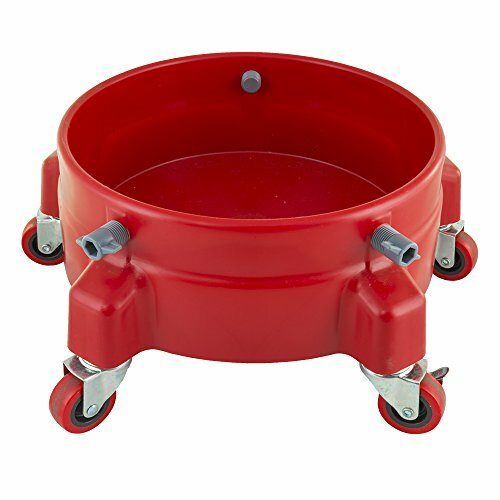 This bucket dolly can fit 3.5 to 7 gallon buckets and can support up to 300 pounds. It even doubles as a detailer creeper so you can keep your knees off the ground and work in a comfortable position. This bucket dolly has 360 degree turning capability, so you can have unlimited control and maneuverability. The bucket dolly also helps you stay organized by holding your detailing brushes, towels and cleaners so you can roll them around wherever you go. Also, the bucket dolly has locking casters that will prevent the dolly from rolling away so you can stay in complete control of your equipment. Remember when you could move that couch with ease? 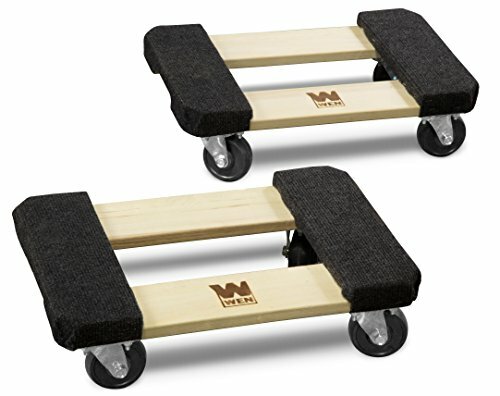 The WEN 1000-Pound Capacity Furniture Dolly handles over 1000 pounds worth of tables, boxes, sofas, tools, armoires, and more. You name it, these dollies will move it. 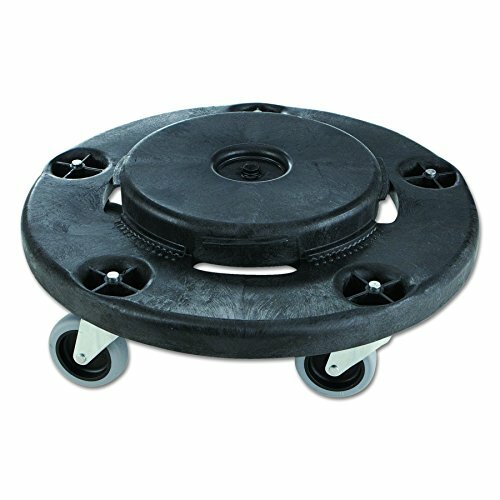 The carpeted surface prevents marring and scuffing to sensitive cargo while the four 2.75-inch ball bearing swivel casters make for easy rolling in any direction. The design features a 18-by-30-inch surface that keeps your load elevated five inches off the ground. Perfect for workshops, schools, offices, garages, and more. Remember when you could wheel your life wherever you wanted? Remember WEN. The Ready Lifter Lifting Aid is the ideal moving and lifting system for the apartment renter or lightweight user. With a recommended carrying weight of 600 lbs., it is the perfect system for helping out with furniture and appliances around the house or apartment. This product was specifically designed for homeowners and renters in residential use. Manufactured by Nielsen Products, makers of the Shoulder Dolly, the Ready Lifter was created for the homeowner, apartment renter, college student, or anyone who wants to move that big bulky item from one place to another. Easy for any 2 people to utilize together with adjustable straps. Lifts objects up to 10-Feet long and 600 lbs heavy. The kit includes two polypropylene harnesses and one 12-Feet long x 3-Inch wide polypropylene lifting strap. Looking for higher weight-carrying capability and increased comfort while moving? Look for Nielsen Products' Shoulder Dolly and Shoulder Dolly Pro Lift. MOVING STRAPS LIFTING AID - The Ready Lifter recognized the need for your arms to be unconstrained. The need for stabilization, opening doors, and overall balance is all attained with the Ready Lifter. Allows for temporary use of one free hand. REDUCE BACK PAIN - Back pain and strain is avoided by ensuring proper lifting techniques and utilizing the body's strongest muscles, the legs and torso. INCREDIBLE VERSATILITY - Due to the seemingly unlimited adjustability of the strap through the buckle, users can move and lift heavy, bulky furniture easier than ever. Sometimes you just need to move your sled around your shop. 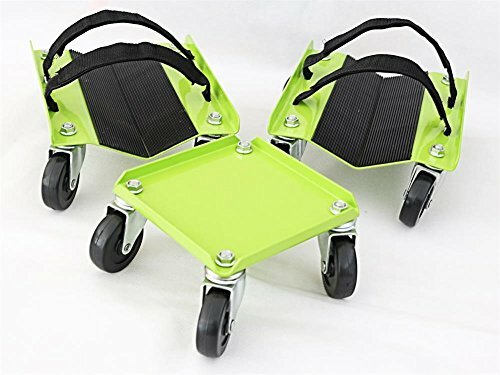 These economy dollies are perfect for smooth, flat surfaces, and maneuvering your sled in limited space. Painted steel dollies feature a 2. 5" nylon wheel, rubber pads, and a single Velcro strap. Swivel casters allow easy movement and smooth turning. Dollies arrive pre-assembled and ready to use. Includes two ski dollies with Velcro strap and one track dolly. 1-year replacement . 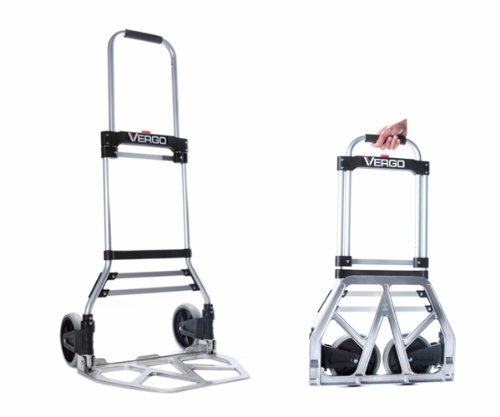 Vergo S300BT Collapsible Hand Truck is lightweight but strong enough for transporting every day items. Great for use at campgrounds, picnics, trade shows, while traveling, school, or work! Easily haul luggage, boxes, groceries; water bottles, paperwork, potted plants and much more! Features telescoping handle, foldable nose plate, nestable wheels, solid rubber wheels, aluminum frame, and can handle up to 275 lbs. - Telescoping handle (extends to 42.5" H) ; folding nose plate opens in seconds. - Nesting wheels automatically move into place when folding or unfolding nose plate. - Completely folds down and out of the way for easy storage (only 2.5" thick!). - Aluminum frame.- Black and silver finish. - No assembly required; ready to use right out the box. Our MaxxHaul Tire Dolly is designed to easily transport car, light truck, SUV tires and wheels. Constructed from high impact injection molded polyethylene for durability. Tire dolly makes it fast and easy to move tires through service bays and storage areas. Dolly can accmodate up to five tires and wheel assemblies or up to 8 tires. Moves 360 degress for maximum manuevarability. Two units can be connected together and work as a creeper or a dolly for moving other lightweight appliances, furnitures, etc. Features four 3" non-marring swivel castors. Includes storage located in middle of dolly with locking cover for your tire accessories. Maximum load: 250 lbs. Overall size: 25" dia x 4.5" high. Remember when you could move that couch with ease? The WEN 1000-Pound Capacity Furniture Dolly handles over 1000 pounds worth of tables, boxes, sofas, tools, armoires, and more. You name it, these dollies will move it. 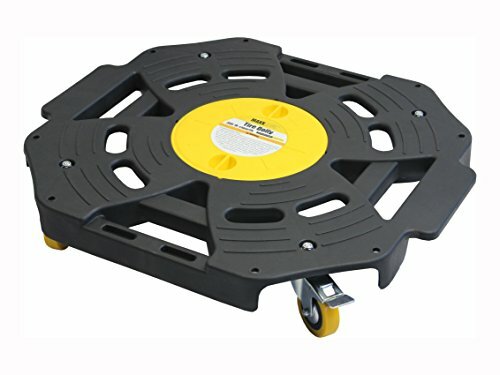 The carpeted surface prevents marring and scuffing to sensitive cargo while the four 2.75-inch ball bearing swivel casters make for easy rolling in any direction. The design features a 12-by-18-inch surface that keeps your load elevated five inches off the ground. Perfect for workshops, schools, offices, garages, and more. Remember when you could wheel your life wherever you wanted? Remember WEN. 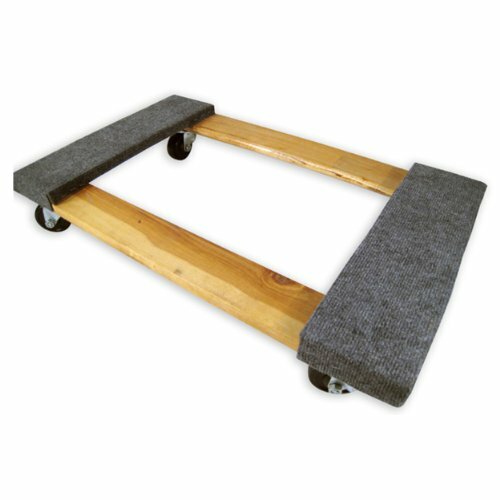 The Vestil FWD-1824-3R fiber wood dolly has a fiber wood frame, a rubber surface, two hand holes, and four swivel caster wheels, and can be used to transport appliances, crates, furniture, or other large, heavy objects. The dolly is made of fiber wood, which weighs less than typical solid hardwood and is resistant to chipping. A rubber surface helps prevent loads from slipping. A PVC (polyvinyl chloride) strip along the edge of the dolly helps protect walls from scrapes. Two hand holes allow the dolly to be lifted and carried. 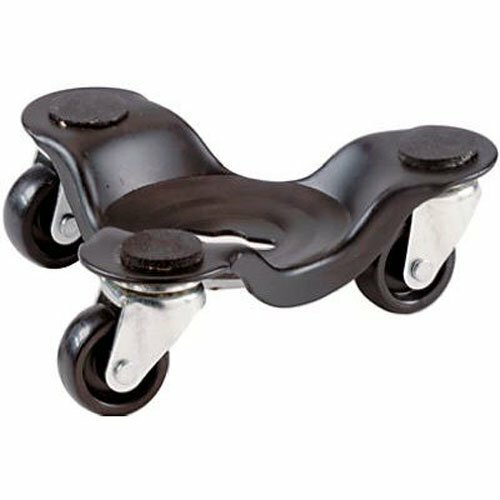 The caster wheels swivel for maneuverability, measure 3 inches in diameter, and are made of solid rubber, which can t go flat and is resistant to wear. This dolly has a load capacity of 800 lb., weighs 16 lb., and measures 4-11/16 x 17-7/8 x 23-3/4 inches (H x W x D). (H is height, the vertical distance from lowest to highest point; W is width, the horizontal distance from left to right; D is depth, the horizontal distance from front to back.) This product is intended for use in professional and industrial environments. Dollies are used to transport any of a variety of large, heavy objects, such as cabinets, crates, drum containers, furniture, heavy machinery, large appliances, rolls of carpet, or totes. 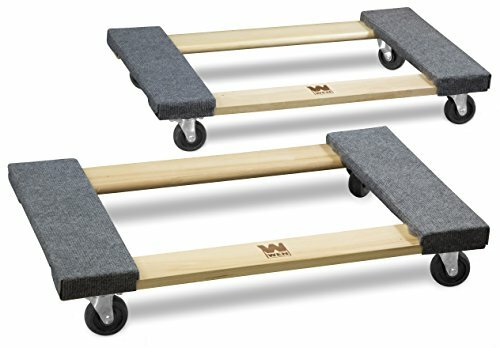 Dollies are typically comprised of a low platform or deck mounted to caster wheels that may swivel for maneuverability and may include brakes to keep the dolly from rolling. Some dollies have adjustable frames to transport loads of different sizes. Others come with a pull handle to help the user move the dolly. Dollies can be used by professional movers or in warehouses or other industrial environments. The Stalwart Wheeled Dolly helps you get tough jobs done quickly and with ease. 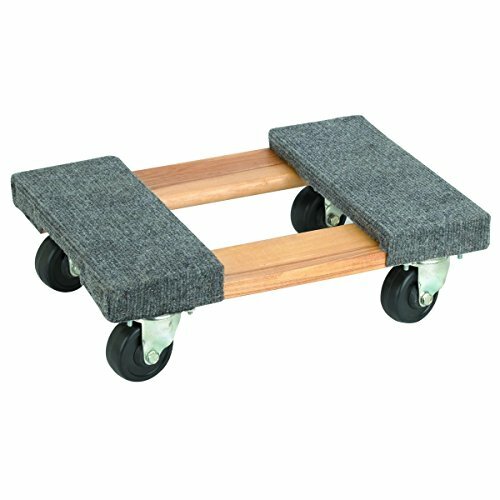 This rolling dolly is ideal for moving furniture, appliances, equipment and boxes at work or at home. 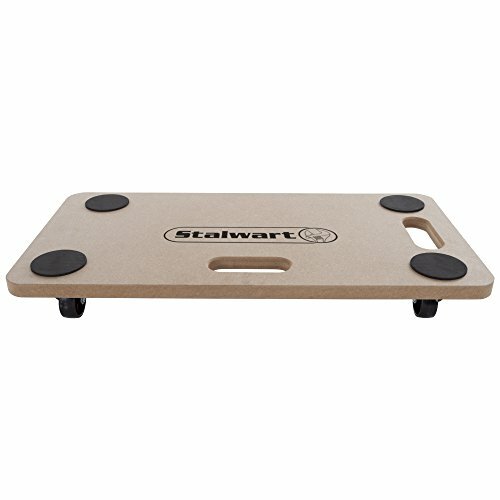 This sturdy mover can handle up to 440 pounds and the non-slip pads help keep your valuables from moving or shifting. IMPORTANT : Avoid buying counterfeit products and transacting with unauthorized sellers. Look for our logo on the packaging for every one of our products. Stalwart committed to providing the consumer with the absolute best price and value on all of our products, which we ensure by applying a rigorous Quality Control process. Stalwart is a registered trademark protected by U.S. Trademark law and will be vigorously defended. MOVING MADE EASY -Moving big objects can be difficult and uncomfortable. 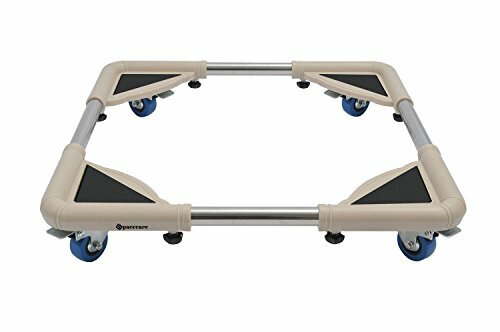 The swiveling casters and wheels of this heavy duty dolly make moving heavy or bulky objects easy, and help it to glide across concrete, wood or other hard surfaces. 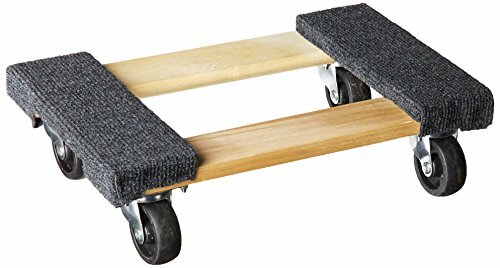 LIFT HEAVY OBJECTS - Moving boxes, planters, office items, furniture or small appliances is a breeze with the Stalwart roller dolly. It can hold up to 440 pounds and the non-slip patches help keep your cargo in place and prevent your objects from sliding off while transporting. DURABLE - The Medium Density Fiberboard (or MDF) roller cart is built to last and built to help you get your task done with ease. Sturdy and strong with handles on the side and top of the dolly, it is simple to carry and store between uses.